Karl Smith has some anecdotal evidence too, but he also has some statistical evidence to offer. 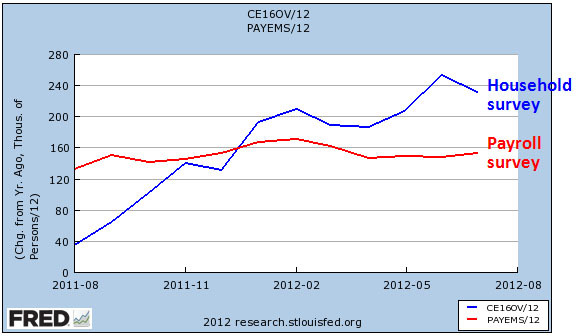 According to the BLS payroll series on employment, job growth has been pretty flat for the past year (that’s the red line). But the household survey tells a different story. From a near stall in June, employment growth has been accelerating steadily for the past year and is now up to nearly 250,000 new jobs per month. So maybe the economy is doing better than we think. It’s worth noting that none of this matters much for the election. If the economy really is poised for takeoff, it will come too late to do Barack Obama any good. For now, this is just something to scratch our chins about.